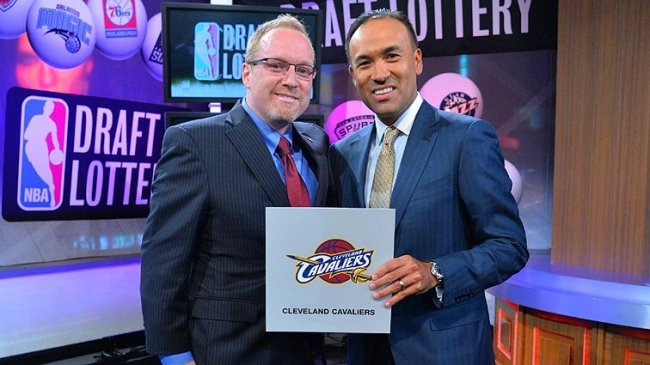 Exciting times for the Cleveland Cavaliers on Tuesday night as general manager David Griffin walked out of the NBA Lottery with the No. 1 overall pick. It was the third time in four years that the Cavs “won” the top pick in the draft. The last two times they came away with a very talented player in Kyrie Irving, and an injured, overweight and asthmatic Anthony Bennett. In what is widely expected to be a three-player draft, the Cavs now hold the key as they can decide among Andrew Wiggins, Joel Embiid or Jabari Parker with the top pick – a decision they simply must get right. “I think it’s beyond the No. 1 pick,” Griffin told the team’s website. “We’ve talked a lot about improving our floor spacing and our basketball IQ, we need to improve our toughness, we’re a team with several needs quite frankly, and we need to address our fit as much as anything else. While it is great the the Cavs hold the No. 1 pick, it seems odd to be celebrating something based on pure luck. The Cavs were only in the lottery again because we’ve just witnessed the worst four-year stretch (a combined record of 97-215) since the Ted Stepien years. Stepien was the worst owner not named Art Modell in Cleveland history, which is saying a lot as we know from bad owners in this town, so that is not a favorable comparison. The current Cavs still don’t have a coach, have a first-time general manager in Griffin and an impatient owner in Dan Gilbert. But they also have Irving, Dion Waiters and, well, not much else (maybe Spencer Hawes?). But pairing them with another top pick can only help with the coaching search. “It seems surreal,” Cavs vice chairman Jeff Cohen said in published reports. “This is three out of four years, and we had a 1.7 percent chance of coming up with the first pick and we pulled it off again. While the Cavs as an organization were winners Tuesday night, we feel bad for Nick Gilbert. After spending the past few years representing the Cavs at the lottery, he was absent last night, meaning he missed out on a prime opportunity to be suave with Mallory Edens, daughter of Milwaukee co-owner Wes Edens, and Anjali Ranadive, daughter of Sacramento owner Vivek Ranadive, who were representing their respective teams. Maybe next time. One of the best parts of the night was the reaction from certain corners of the media who were upset that the Cavs won the lottery again (a “groan-inducing moment” according to Sports Illustrated), rather than other teams that “deserved” it more, like say the Boston Celtics. But that’s their problem and is not something that Griffin or Cleveland needs to worry about. The important thing now is to get this pick right. It’s nice to be a lottery “winner,” but the time has come for the Cavs to start winning when it counts – on the court.